The heat has broken, just today, at last. But watching my garden go yellow with fever over these past three weeks of 100+ degrees and rotisserie winds has left me ready to burrow into the cool earth and thinking of the Villa Livia, where a windowless, subterranean room adorned with a cool blue sky and eternally unwilted plants served as a refuge from the Roman summer sun. Villa Livia is thought to be part of the dowry of the inimitable Livia Drusilla (58 BC-AD 29), wife of Octavian, mother of Tiberius, who wielded enormous though unofficial power during the Republican era. 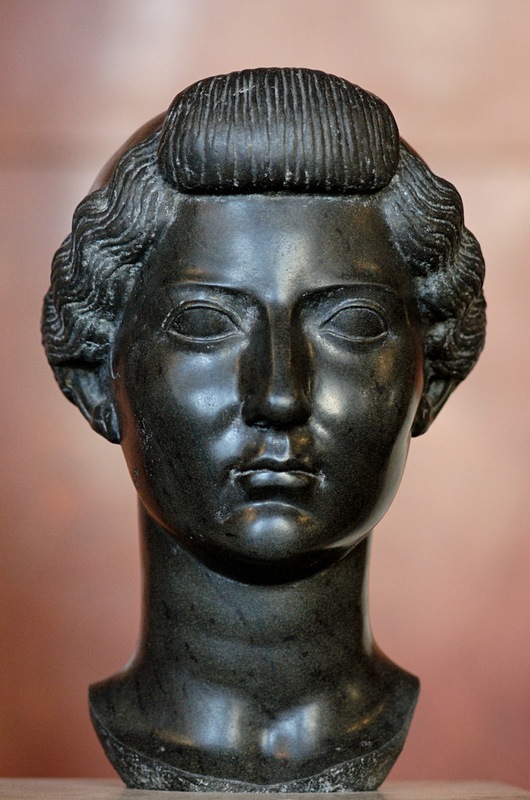 Considered the model of the Roman matron, she was given the unusual freedom to handle her own finances and became the first woman to appear on provincial coinage in 16 BC. 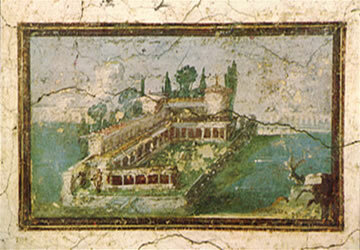 Fifteen kilometers north of Rome, her suburban estate offered a commanding view of the Tiber valley as well as a place of relaxed entertaining--and subtle power-broking--for a woman who was said to avoid excessive jewelery or pretentious costume and to handsew clothes for her husband the emperor even while serving as his trusted political advisor. And she kept chickens. Famous white chickens. AND she provided the storied laurel crowns of the champions of Rome. Pliny's Natural History records the legend that on the day of Livia's marriage to Augustus an eagle flew over the garden of the villa and dropped its dinner into her lap: a white chicken holding a branch of laurel in its beak. 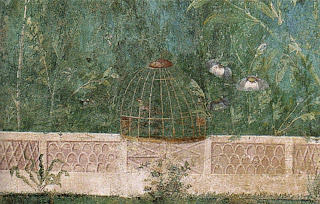 Livia rescued the chicken, and planted the laurel. 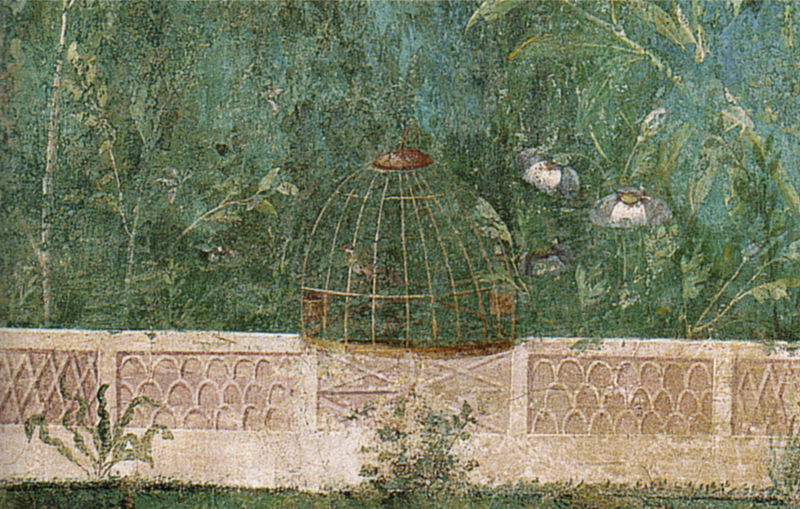 The lone fowl became a chicken farm (the villa's nickname was 'white hens') and the laurel a lush grove whose branches crowned the heads of triumphant Roman generals. Was it the laurel's evergreenery that inspired the everblooming underground garden? 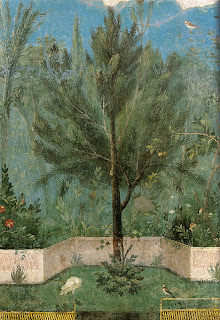 Its illusory landscape covered all four arms of the soothingly cool room, depicting birds, small fruiting trees and flowering plants in simultaneous bloom. 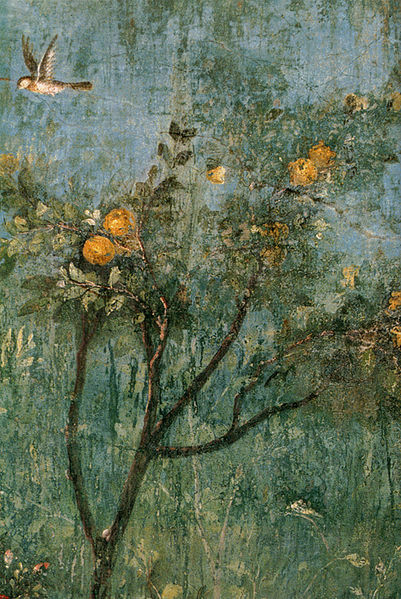 According to Gardens of Italy by Ann Laras, twenty-four species are represented, a beautiful record of desirable plants in the Roman garden c. first century B.C. : the strawberry tree, bay laurel (of course), oleander, holm oak, English oak, Cornelian cherry, myrtle, harts-tongue fern, early dog violet, crown daisy, stinking chamomile, Italian cypress, quince, stone pine, pomegranate, opium poppy, cabbage rose, and date palm. 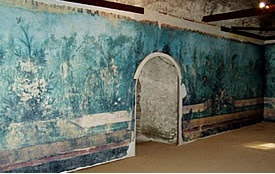 The underground garden room was discovered in 1863 and the frescoes removed in 1955 to the National Museum in Rome. 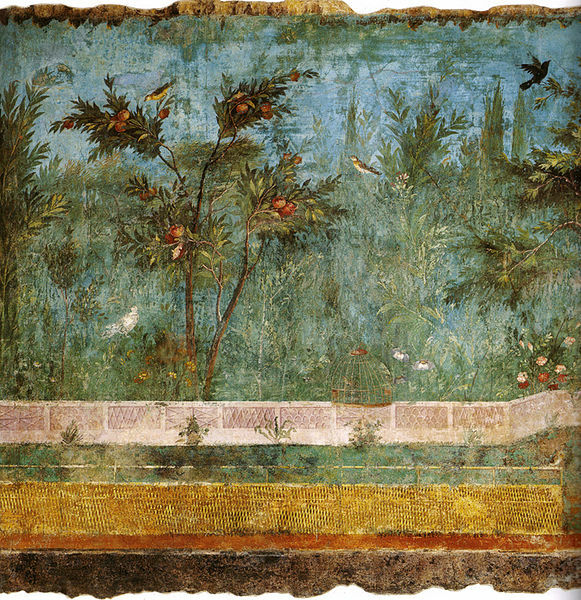 The rest of Livia's landscape--a peristyle garden, a broad terrace, and perhaps hanging gardens watered by her personal connection to the aqueduct (true luxury)--is currently under excavation. "Now the forest was dried to the very roots, and all the pullets were dead, to the very last." Also the temple of the Caesars was struck with lightning and the heads of the statues all fell off at once. But really it was the chickens. Chickens as harbingers of apocalypse. I like that. Glad you are enjoying garden history. I am just finishing my MA dissertation from Birkbeck, U. of London. Hard work but interesting. Where are you studying? I have just spent three weeks in the States, DC, Carolinas, and visited Dumbarton Oaks twice. My dissertation is on Vernacular English middle-class metropolitan fringe gardens... a relatively unexplored area which has raised some issues of labelling. Should we be concerned that most of the chickens eaten today are white? I really enjoyed this post; I had seen pictures of the garden room before but I knew nothing of the historical background of the estate. Something about this post has struck a nerve here. My mouth was agape at points. Very nice. Ah some sunshine would be nice - it just rains in London. 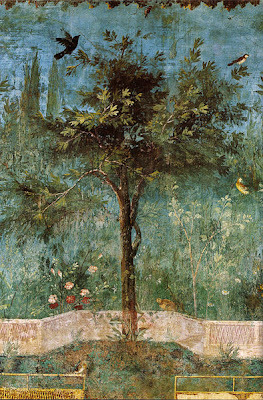 On my blog I quoted a few points made by Barbara A. Kellum that connect the garden room with the wider symbolic landscape of Augustan Rome.